A team of researchers from Rochester Institute of Technology report that a new class of carbon nanotubes could be the answer to cleaning up of toxic sludge and contaminated water. In a research paper published in the March issue of Environmental Science Water: Research and Technology, they explain that enhanced single-walled carbon nanotubes deliver a better and sustainable method to water treatment and remediation compared to the typical industry materials—silicon gels and activated carbon. The potential of this emerging technology to clean polluted water was demonstrated by RIT researchers John-David Rocha and Reginald Rogers, who are the authors of the paper. They applied carbon nanotubes to environmental issues in a specific new approach that builds on about 20 years of nanomaterial research. Nanotubes are more universally associated with fuel-cell research. This aspect is new — taking knowledge of carbon nanotubes and their properties and realizing, with new processing and characterization techniques, the advantages nanotubes can provide for removing contaminants for water. Rocha and Rogers are progressing nanotube technology for environmental remediation and water filtration for domestic use. Carbon nanotubes are storage units, and measure approximately 50,000 times smaller than the width of a human hair. Carbon reduced to the nanoscale flouts the principles of physics and functions in a realm of quantum mechanics in which small materials become powerful. We know carbon as graphite for our pencils, as diamonds, as soot. We can transform that soot or graphite into a nanometer-type material known as graphene. The RIT researchers formulated new methods for controlling the miniature materials. The method developed by Rocha was for isolating superior quality, single-walled carbon nanotubes and for classifying them according to their metallic or semi-conductive properties. Rogers redistributed the pure carbon nanotubes into thin papers similar to carbon-copy paper. 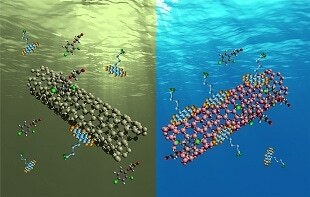 The filtration process is effective because “carbon nanotubes dislike water,” he added. Just the organic contaminants present in the water stick to the nanotube and not the water molecules. This type of application has not been done before. Nanotubes used in this respect are new. The paper was co-authored by Ryan Capasse, RIT chemistry alumnus, and Anthony Dichiara, a former RIT post-doctoral researcher in chemical engineering presently at the University of Washington.